Update: Auberge Resorts has bought Malliouhana and re-opened as of November 1st, 2014. More on Malliouhana, an Auberge Resort. 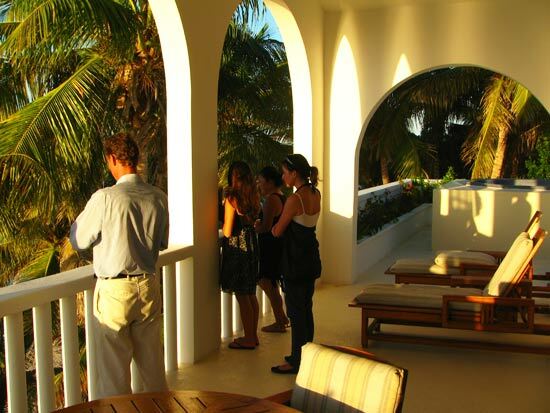 In the early years, a visit to Malliouhana for sunset drinks was our most magical Caribbean vacation must-do. 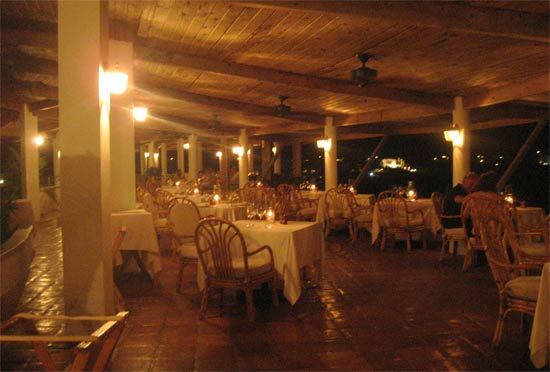 We dined at the Malliouhana Bistro, always craving and loving their true French-style French fries. As children, we were envious of the kids who got to play in "The Pirate Ship." 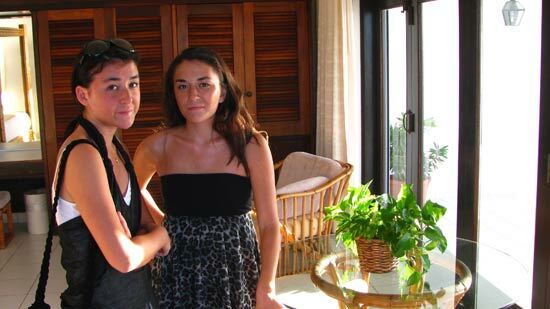 My Mom, would have loved to spend the day at the luxurious Malliouhana Spa! 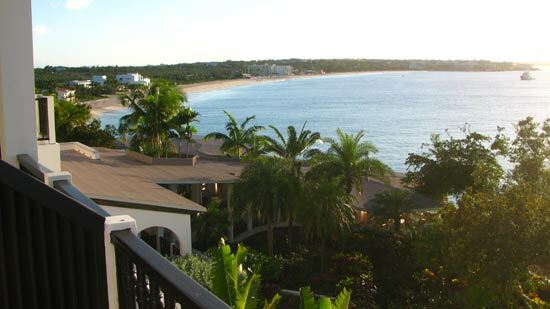 It was the perfect Anguilla resort. 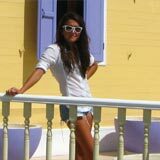 As time passed, we fed our curiosity about the island, trying new spots for lunch and drinks, and visiting different Anguilla hotels and resorts too. For a while we were distracted from our original special spot on the island. 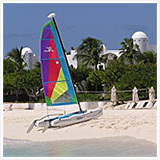 Despite all of the visits to Anguilla, Malliouhana, and the hundreds of walks along their beach (Meads Bay), we had never truly been acquainted with the whole luxurious Anguilla resort. 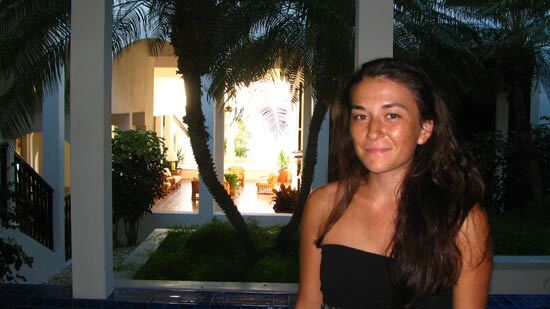 We were always on the outside peeking into the private, quiet, and calm hotel. The thought of what it was like within always lingered. 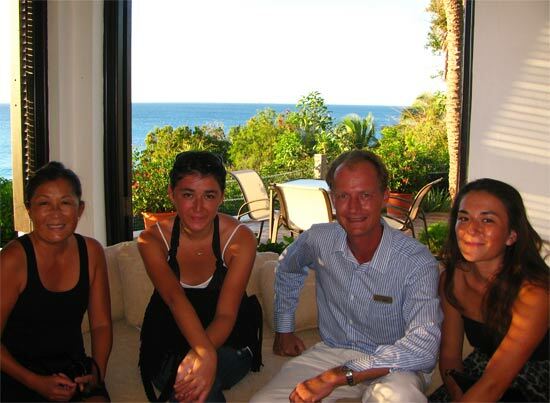 By coincidence we encountered Bart van Deventer (Malliouhana's Resort Manager). 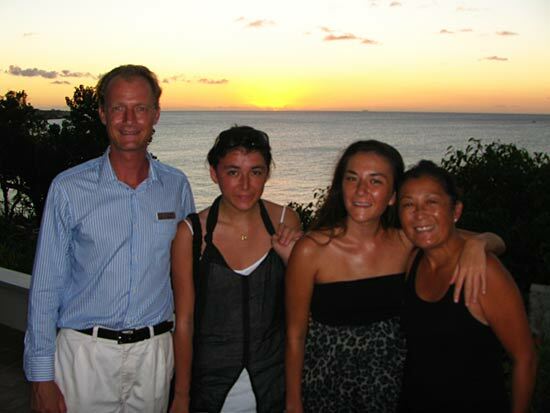 He invited us to see the resort in its entirety, enjoy Malliouhana's magical sunset (again), and later dine at their five star restaurant. We were about to be taken back to a time of classic Caribbean luxury. 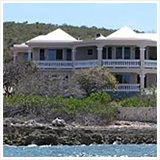 Malliouhana was Anguilla's first luxury resort. 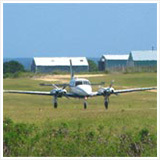 It is owned by the Roydon family who built it in the 1980s. 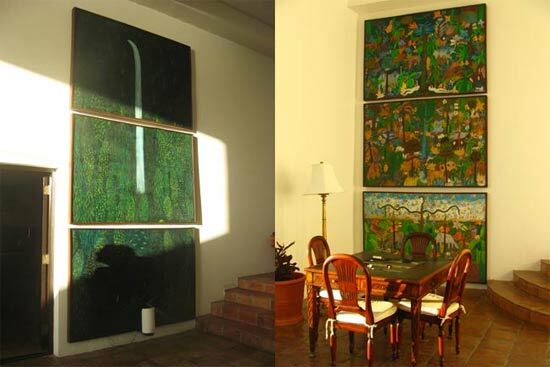 It was designed by Lawrence Peabody, an affluent American who was prominent in the design world, and who lived for many years in Haiti. Knowing the Peabody family personally, and hearing of the love and dedication that went into creating the Malliouhana, enhanced my appreciation for this historic hotel. 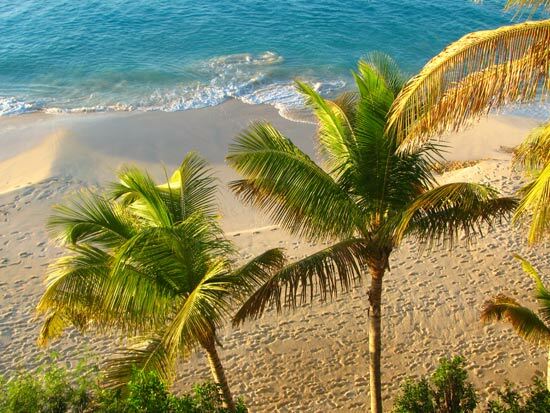 Malliouhana defines true Caribbean luxury as it was intended by a classic figure who lived "the wealthy Caribbean lifestyle." 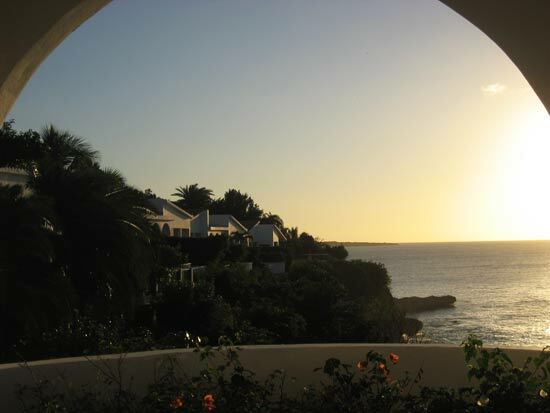 As Bart said, "Malliouhana is timeless Caribbean elegance." Bart greeted us warmly at Malliouhana's spacious, sedate entrance. 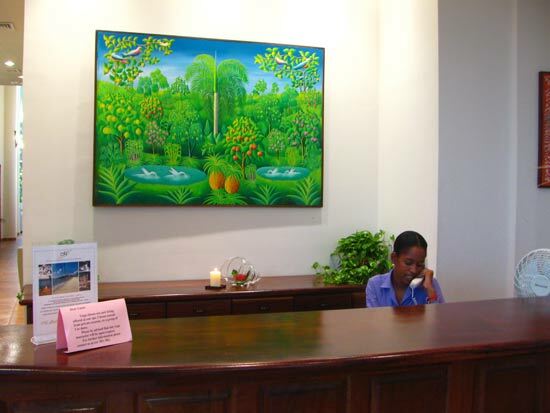 With a small rainforest enclave across from the quiet entrance, we felt truly secluded. As we marveled at the art, Bart mentioned how the hotel just finished installing wireless Internet in every room and in the lobby as well. 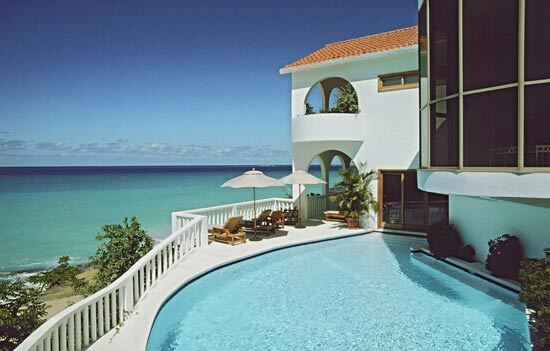 Malliouhana is truly a classic Caribbean luxury hotel... Each modern addition has been included thoughtfully, slowly and with care, never disrupting the hotel's classic feel. 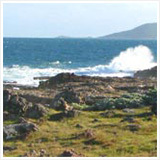 Malliouhana is expansive, covering 26 acres. 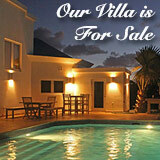 Their property features the Main House (reception area, bar, restaurant, and their lagoon-like pool). The Main House is in the center of the property. Lush gardens sprawl in back of it, featuring more rooms and suites. 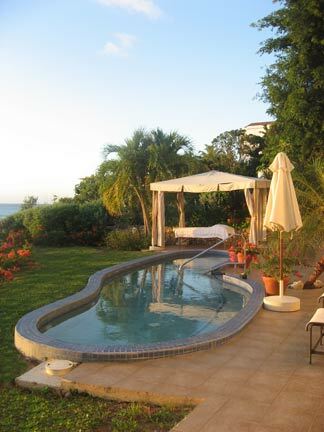 To the west is Meads Bay, with more rooms and suites, as well as The Bistro with a pool area, and their gym and spa. 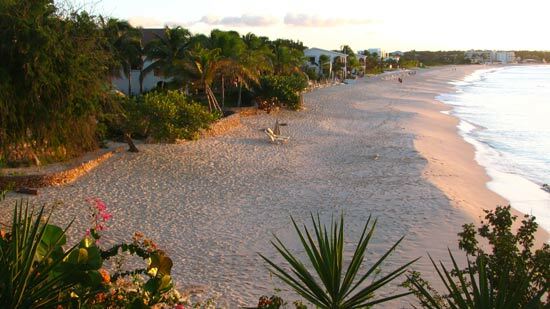 To the east is their "bluff" with the secluded Turtle Cove beach below, their junior and larger suites are located here. While it is expansive, this exclusive hotel only has 55 units. 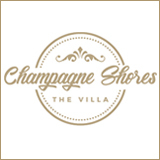 They feature 34 double rooms, 7 one bedroom suites, 2 two bedroom suites, 6 junior suites, 2 jacuzzi suites, 1 honeymoon suite and 1 pool suite. The availability of so much space for so few units results in rooms that are amazingly large and light-filled. First, the double rooms. 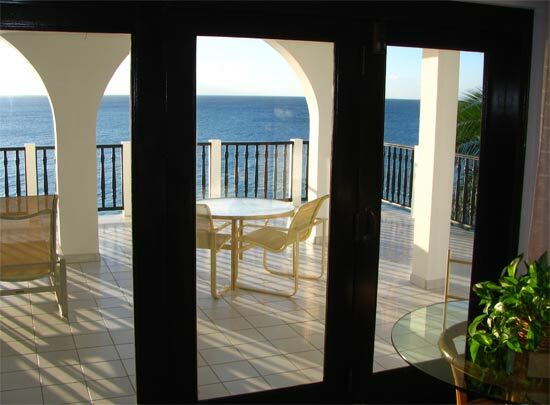 The double rooms are located in the hotel's "Main House," on the top floors of the villas on the beach, in the gardens, and on the bluff. We visited a couple of the double rooms. My Dad gently asked Bart to see one at random as he had heard complaints. Every room we saw was spectacular. Large, radiant, and well appointed. This Anguilla resort is not the latest-in-technology-and-amenities hotel like Viceroy, but we prefer the open, airy feeling. 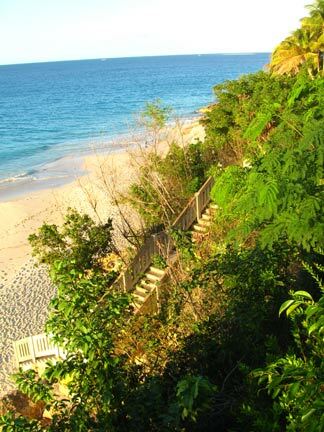 Malliouhana is fit for the world traveler seeking to truly escape, and experience Anguilla from a classic Caribbean perspective. 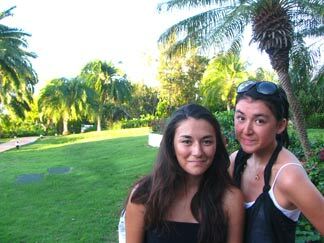 We all hopped into a six-person go-kart, and traveled down a quiet paved path, lined with Malliouhana's impressive gardens and luscious plants, to the suites on the bluff. My Dad is a gardening fanatic. Along the way he couldn't stop "oohing and awing" over the huge tropical plants they were able to grow. These suites were truly spectacular ranging from 1700-2500 feet. 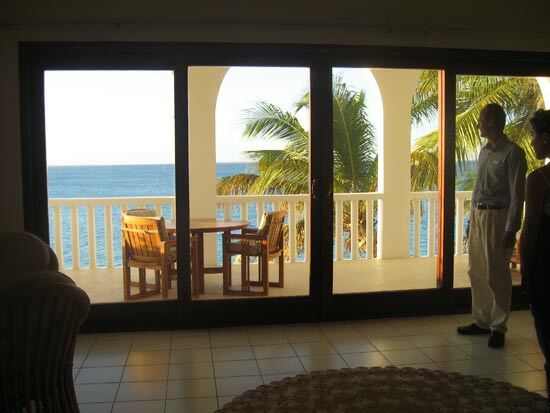 Each junior suite is roughly 1700 ft, opening up onto a larger terrace overlooking Turtle Cove beach (where sea turtles actually come up to nest). 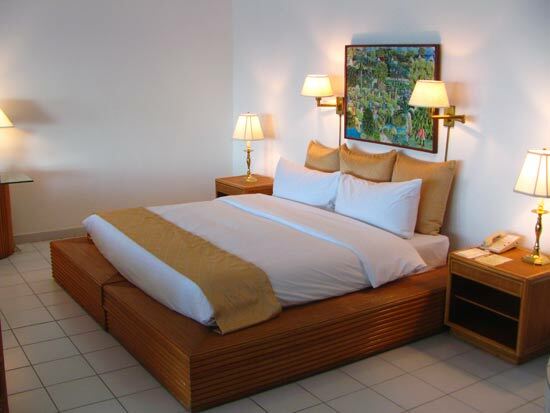 Like the double rooms, they are incredibly spacious and comfortable. 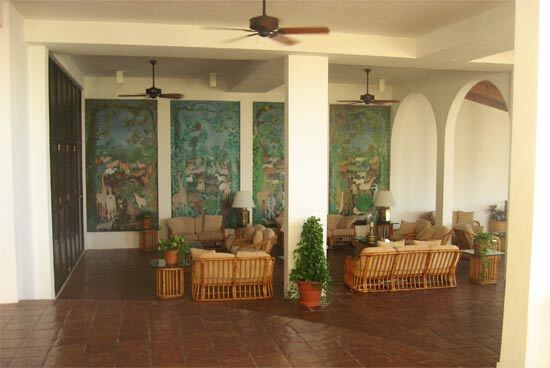 As always, lovely Haitian art adorns the walls, and beautiful Caribbean-style furniture is used throughout. Each junior suite has a large marble bathroom as well (all bathrooms in every room have recently been completely redone). Turtle Cove is a special beach, so secluded. 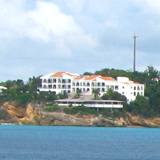 It is between Meads Bay and Long Bay (to the east), but cut off from both of them. I have seen it from the sea before, and always wondered, "how do you get there?" It looks like heaven, after all. Bart told us there are only two ways to get to Turtle Cove. The first is by boat. The Honeymoon Suite was the most impressive suite we saw that day! 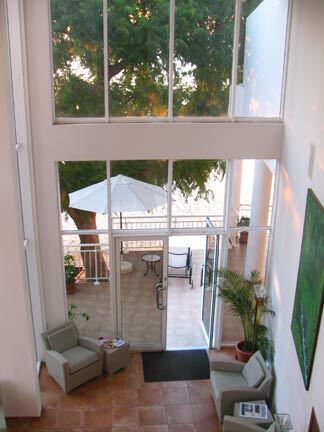 It is over 2000 feet, with a huge bedroom that opens up onto a beautiful patio. 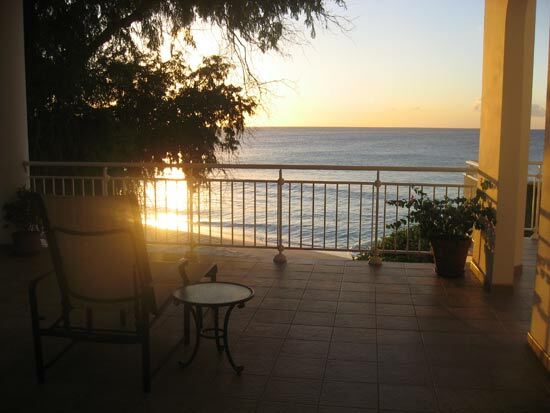 Like all suites "on the bluff," the Honeymoon Suite gazes out to the sea, looking down at the quiet Turtle Cove. The master bedroom is spectacular with the highest ceilings we had seen so far! 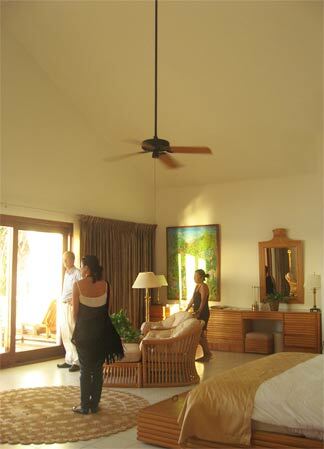 In the photo to the right, look at how "low" the ceiling fan dangles! 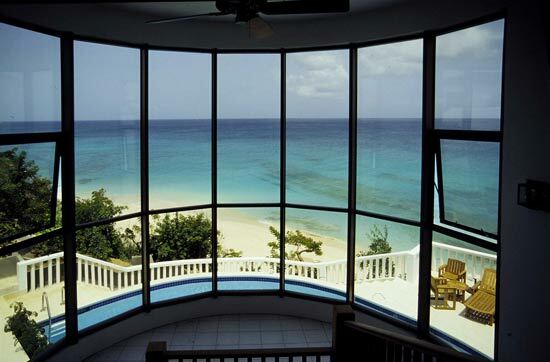 This was one of the most spectacular rooms we have seen in Anguilla. As you enter the Honeymoon Suite, you are also met with a large sitting space. 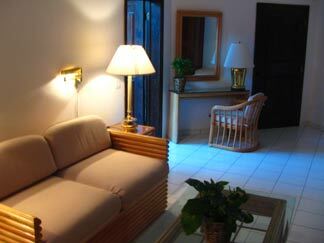 The suite is certainly spacious enough for a family of four to live comfortably! Not to mention the space outdoors too! The jacuzzi is located in the corner of the terrace. 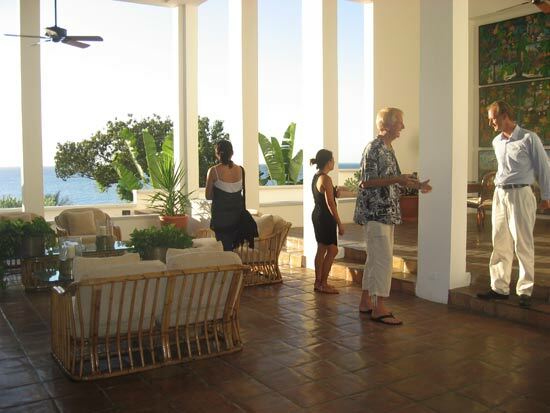 The terrace wraps around, with openings from the large bathroom and from the bedroom. The Pool Suite looks and sounds divine... More than 5000 feet, with a master bedroom, 300 foot bathroom, a lounge, study/junior bedroom, and a six foot deep pool! 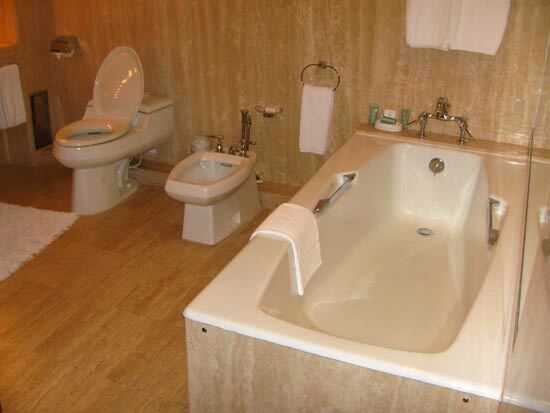 Judging by the Honeymoon Suite, the Pool Suite must be truly special. Too bad we didn't have enough time to stop. The sun was setting... Sunset drinks were calling us! Our last stop before watching the sunset? Malliouhana's luxurious spa and gym! Now I Know What They Are Talking About! The spa leaves you breathless. I could see my Mom's eyes widen. The spa and salon is over 15000 square feet. 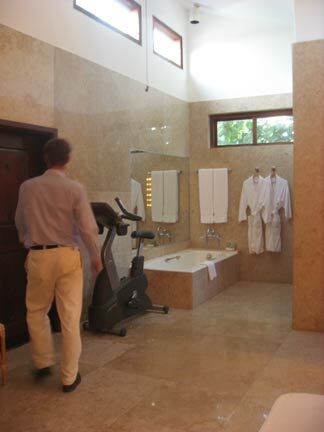 For guests the spa facilities (fitness room, steam rooms, saunas, showers, Jacuzzi (in the photo to the right), and lockers/changing area) are complimentary. The steam rooms and saunas are just across from the quiet jacuzzi. Upstairs from the steam rooms and saunas, by elevator (Anguilla's first elevator?) 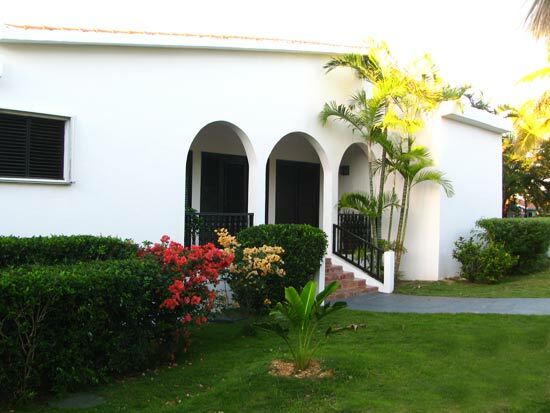 are 5 treatment rooms, and one outdoor treatment room. There are three more private spa suites with balconies. They typically use these rooms for groups or couples. 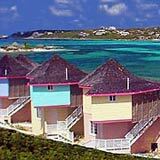 These spa suites were big enough to live in during an Anguilla vacation! The spa suites started shining a special shade of an orangey-glow. We knew that meant it was time to go. We didn't want to miss the sunset! The sports selection at Malliouhana doesn't end here. 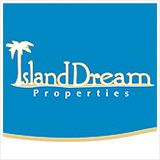 They also offer: windsurfing, water skiing, snorkeling, sunfish/laser/hobie sailing, 4 tennis courts with night lights, half court basketball, and three pools and a jacuzzi. As tradition goes, my Dad ordered a rum punch and my Mom had a Carib. I was swayed by the rum punch, but something inside pulled my heart another way. I found myself saying, "Can I have a diet Coke with some grenadine please?" Bart added with a knowing smile, "With extra cherries?" I laughed. He remembered! Yuki said, "Me too, please." We sipped our drinks and enjoyed the tasty plantain chips. It felt like old times. 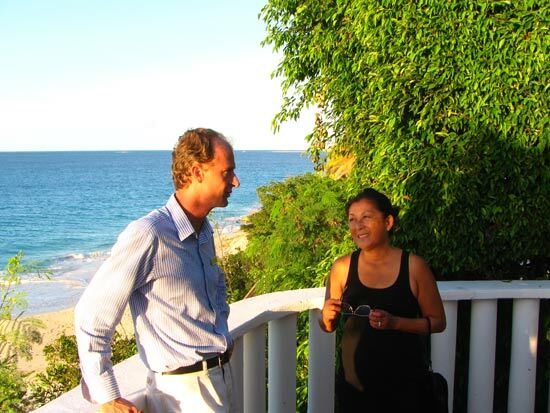 To have Bart, and later Amelia Vanterpool-Kubisch (we have known Amelia for years - she is a kind, sweet lady who was once the director of the Anguilla Tourist Board, now working at Malliouhana), join us was an honor. Bart was most generous and kind, and we learnt that he is an interesting character too! 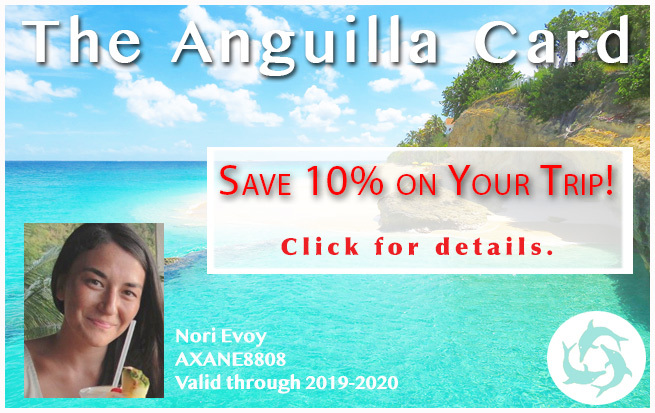 He has been living in Anguilla for over 10 years. He left Holland many years ago for St. Maarten to work and surf, and then moved to Anguilla when St. Maarten started changing. He hasn't moved back to Europe since. He still surfs, giving me a few tips on where the good waves can occasionally be found. In great company, we sat, sipped, chatted and munched as the fiery hues faded into the dark night sky. As we spotted the night's first stars I thought, "What a perfect evening!" It had been too long since our last one. Sunset drinks at Malliouhana still is our #1 magic moment. As the night air turned cold, and our tummies rumbled louder, Amelia said good-night and Bart brought us to Malliouhana's restaurant. He would be leaving us in the care of Malliouhana's sommelier, Albert Lake. As we waited for him, Bart took us to the restaurant's edge, perched above the rocky shore below. The lights in the sea light up the water at night, and you can see the Tarpin swim! With a strong affection for sea life, it felt like magic. Albert Lake shook us our hands and prepared to bring us to the wine cellar, and later to our table. But that's a story for another time. ;-) For now, I will just say order the lobster soup to start! We parted ways with Bart and thanked him deeply for a wonderful evening. 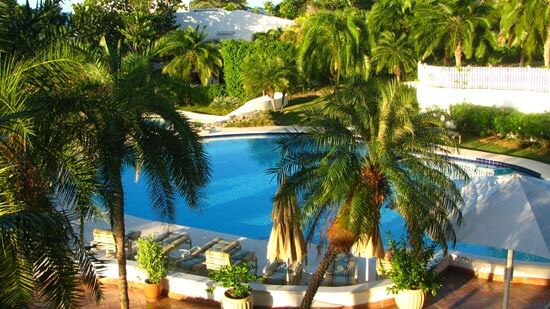 We had been brought back in time to one of the great historic hotels that reminded us what Anguilla was and in a way, should be... Quiet, secluded, simple, and still luxurious. Malliouhana provides an experience so unique, it is perhaps the most memorable and fitting Anguilla resort, perfect for those with a curious spirit and an admiration for true Caribbean luxury. 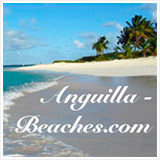 The experience also brought us back to our own history, reminding us of our first travels to Anguilla. That evening, we really did travel through time. The only thing we all were thinking at the evening's end?... "When can we go back?"